Expediting the end of mass incarceration will require accelerating the end of the Drug War and scaling back sentences for serious crimes. While most states have downsized their prison populations in recent years, the pace of decarceration is insufficient to undo nearly four decades of unrelenting growth. Source of historical figures: Bureau of Justice Statistics (1982) “Prisoners 1925-81”; Bureau of Justice Statistics Corrections Statistical Analysis Tool. The U.S. prison population grew by more than 600% between 1973 and 2009—from 200,000 people to 1.6 million. Tough-on-crime policies expanded the number of imprisoned people even while crime rates plunged to 40% below their levels in the 1990s.1)Between 1991 and 2009, the violent crime rate fell by 43% and the property crime rate fell by 41%. Source: FBI Uniform Crime Reports. In recent years, policymakers and criminal justice professionals have implemented reforms to correct the punitive excesses of the past. By yearend 2016 the number of people held in U.S. prisons had declined by 6% since a 2009 peak, and crime rates have continued to decline.2)In 2016, 1.3 million people were serving sentences in state prisons and 172,000 were doing so in federal prisons. As the prison population declined between 2009 and 2016, the violent crime rate declined by 11% and the property crime rate declined by 19%. Source: FBI Uniform Crime Reports. But the overall impact of reforms has been quite modest. With 1.5 million people in prison in 2016, the prison population remains larger than the total population of 11 states.3)This figure excludes the population held in local jails, which totaled 740,000 in 2016. If states and the federal government maintain their recent pace of decarceration, it will take 75 years—until 2093—to cut the U.S. prison population by 50%. Expediting the end of mass incarceration will require accelerating the end of the Drug War and scaling back sentences for serious crimes. The federal prison population declined 13% between 2011 and 2016, twice the nationwide rate of decarceration. The number of people in federal prisons continued to decline in 2017, despite the “law and order” rhetoric of President Trump and Attorney General Sessions.4)The federal prison population further downsized in 2017, reaching 184,000 at yearend. The Department of Justice has forecast an average daily population of over 192,000 people in federal prisons in fiscal year 2019. These reductions are the result of a mix of changes in policy and practice designed to reduce admissions to prison and lengths of stay. Moreover, the states with the most substantial reductions in their prison populations have often outpaced the nationwide crime drop. But overall, the pace of decarceration has been very modest in most states. In 20 states the prison population reduction is less than 5%. Texas and Florida, which rank first and third highest among states in the size of their prison populations, have reduced their prison populations by just 4% since reaching their peak levels.5)While Texas has only modestly reduced its prison population, the state’s imprisonment rate—which is the number of prisoners per 100,000 residents—has declined by 26% between 1999 and 2016, largely due to substantial growth in the overall state population. Source: Bureau of Justice Statistics Prisoners Series. Eight states had not achieved any prison population reductions by 2016, even though most are experiencing crime rates that are far below their peak levels. 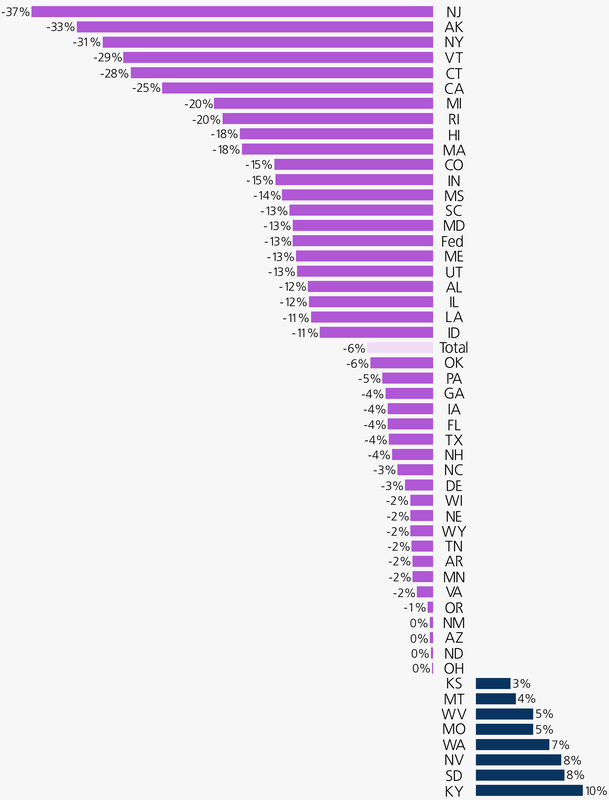 Among these states, the largest 5-year increases in prison populations since 2011 have occurred in Kentucky, with a 10% increase, and in South Dakota and Nevada, each with an 8% increase. Source: Bureau of Justice Statistics Prisoners Series (1999-2016). Note: Illinois data may not be fully comparable across years. The growing recognition of the scale and urgency of mass incarceration is now voiced by leaders as diverse as Sen. Corey Booker and former House Speaker Newt Gingrich. A growing number of policy experts and advocacy organizations are now calling for a 50 percent cut in the U.S. prison population within the next 15 years. These include the ACLU, the #Cut50 initiative led by Van Jones, and Just Leadership USA—a national group led by formerly incarcerated individuals. But the sobering reality is that at the pace of decline since 2009, it will take until 2093 to cut the U.S. prison population by 50%. Many criminal justice reforms have reduced, and sometimes eliminated, prison terms for non-violent and largely low-level drug offenses. These hard-won reforms have reduced the number of people imprisoned for a drug offense by 25% since 2007, when the total number of people imprisoned for a drug offense was at its peak.6)Bureau of Justice Statistics Prisoners Series (2009-2016); Federal Bureau of Prisons (2017, September 23). Offenses. Federal Bureau of Prisons. Retrieved from https://www.bop.gov/about/statistics/statistics_inmate_offenses.jsp. But 277,000 people are still imprisoned nationwide for a drug offense—over half of them (56%) African American or Latino. People with drug convictions comprise nearly half of the federal prison population (46%) and 15% of the state prison population. Even at the federal level, most of those receiving drug sentences were convicted of being “street-level dealers” or for lower levels of involvement in the drug trade. Their imprisonment only creates openings that others fill to meet the demand for drugs. 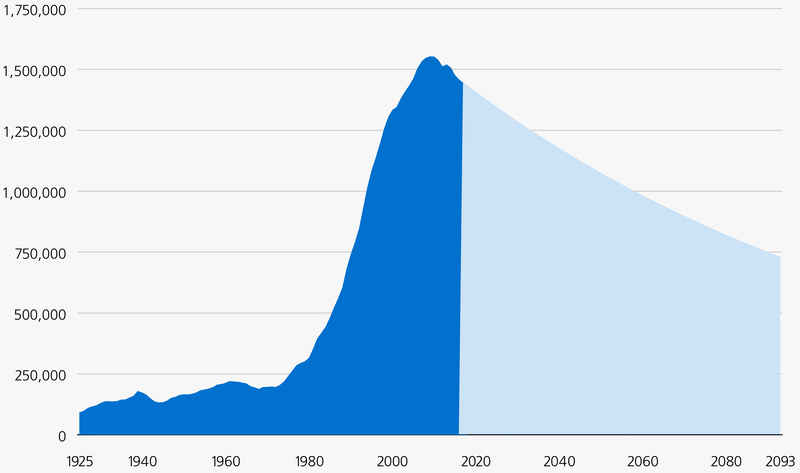 As the National Research Council has stated: “The successive iterations of the war on drugs—through a substantial public policy effort—are unlikely to have markedly or clearly reduced drug crime over the past three decades.” A decades-long emphasis on supply reduction over demand reduction—incarceration over treatment—has failed to stem supply even as prison populations have escalated. It is well past time to end the Drug War. Source: Bureau of Justice Statistics Prisoners Series and Inmate Statistics from Federal Bureau of Prisons Website. Important as it is to end the war on drugs, if we truly want to end mass incarceration, we must also scale back excessive penalties even for serious and violent crimes. Half of the state prison population is serving time for a violent crime, including assault and robbery, and one out of every seven people in prison is serving a life sentence. While public protection is a key element of sentencing in these cases, harsher sentencing policies are resulting in longer prison terms for violent crimes than in the past. Many individuals are still incarcerated long after they have “aged out” of crime and no longer pose a significant public safety risk. Imposing excessive prison terms for violent crimes has not made us safer than other industrialized countries. This approach impedes increased investments in more effective crime-reduction policies such as health insurance coverage to prevent and treat substance use disorder, high-quality early education to expand young people’s educational prospects, and residential mobility programs to reduce neighborhood segregation. States grappling with an uptick in crime should consider these investments, rather than reversing sentencing reforms for low-level offenses as Alaska has done, or considering mandatory sentencing increases as Maryland is doing. Just as mass incarceration was developed primarily as a result of changes in policy, not crime rates, so too has decarceration reflected changes in both policy and practice. These have included such measures as drug policy sentencing reforms, reduced admissions to prison for technical parole violations, and diversion options for persons convicted of lower-level property and drug crimes. The movement to end mass incarceration not only faces political reluctance to meaningfully reduce the U.S. prison population, it has also had to address renewed calls to further expand the prison population, including: increasing prison terms for immigration law violations, reversals of Obama-era reforms in federal sentencing, and punitive responses to the opioid crisis. While defending the progress made in recent years, we must also strive for criminal justice reforms bold enough to tackle mass incarceration. Source: Bureau of Justice Statistics Prisoners Series (1999-2016). Note: Illinois data may not be fully comparable across years. 1. ↑ Between 1991 and 2009, the violent crime rate fell by 43% and the property crime rate fell by 41%. Source: FBI Uniform Crime Reports. 2. ↑ In 2016, 1.3 million people were serving sentences in state prisons and 172,000 were doing so in federal prisons. As the prison population declined between 2009 and 2016, the violent crime rate declined by 11% and the property crime rate declined by 19%. Source: FBI Uniform Crime Reports. 3. ↑ This figure excludes the population held in local jails, which totaled 740,000 in 2016. 4. ↑ The federal prison population further downsized in 2017, reaching 184,000 at yearend. The Department of Justice has forecast an average daily population of over 192,000 people in federal prisons in fiscal year 2019. 5. ↑ While Texas has only modestly reduced its prison population, the state’s imprisonment rate—which is the number of prisoners per 100,000 residents—has declined by 26% between 1999 and 2016, largely due to substantial growth in the overall state population. Source: Bureau of Justice Statistics Prisoners Series. 6. ↑ Bureau of Justice Statistics Prisoners Series (2009-2016); Federal Bureau of Prisons (2017, September 23). Offenses. Federal Bureau of Prisons. Retrieved from https://www.bop.gov/about/statistics/statistics_inmate_offenses.jsp.